The PSD-95 family is encoded by four genes, PSD-95/SAP90 (synapse-associated protein 90), PSD-93/chapsyn-110, SAP102, and SAP97. The structure of these proteins is characterized by the assembly of three PDZ domains, an SRC homology (SH3) domain, and a guanylate kinase-like (GK) domain. SAP97 also has a LIN2/LIN7 (L27) domain at the N-terminal. The PSD-95 family belongs to a protein superfamily called membrane-associated guanylate kinase (MAGUK), which is characterized by the presence of at least one PDZ and one GK domain. Immuno-EM and tomography studies have indicated that PSD-95 is localized very close to the postsynaptic membrane (a mean distance of 12 nm), a good position for interacting with postsynaptic membrane proteins such as receptors, ion channels, and cell-adhesion molecules, as well as with cytoplasmic proteins (Figure 18.2; Colorplate 11). It has been suggested that these interactions are important for PSD-95 clustering and targeting of postsynaptic membrane proteins. It is known that PSD-95 can cluster NMDARs and Shaker-type K+ channels on the surface of heterologous cells31, but the best in vivo demonstration that it also clusters postsynaptic proteins has been found in Drosophila melanogaster, in which mutations in discs large (Dlg), the Drosophila homolog of PSD-95, abolish the synaptic clustering of Shaker K+ channels that bind to the PDZ domains of Dlg32. However, there is still disagreement as to whether PSD-95 is essential for the synaptic clustering of NMDA receptors in mammals, which is certainly not eliminated by the genetic disruption of PSD-9 5 33. PSD-95 probably plays an important role in synapse formation by means of its interaction with neuroligin, a postsynaptic membrane protein that interacts trans-synaptically with P-neurexins, which in turn bind to the PDZ domain of CASK/LIN2 (another scaffold of the MAGUK superfamily of proteins), which is enriched on both sides of the synapse and interacts with other synaptic membrane proteins, such as syndecan and SynCAM34,35. The trans-synaptic neuroligin-P-neurexin interaction seems to be important in inducing pre- and postsynaptic synaptic differentiation36-38, and the amount of PSD-95 regulates the balance between the number of inhibitory and excitatory synapses36. It now seems clear that the most important biochemical function of PSD-95 is to organize the signaling complexes at the postsynaptic membrane. PSD-95 interacts with a wide variety of cytoplasmic signaling molecules and thus, by physically bringing together cytoplasmic signal-transducing enzymes and surface receptors, may facilitate signal coupling in the PSD. For example, the overexpression of PSD-95 in hippocampal neurons increases the number of dendritic spines and the maturation of excitatory synapses39, which may be related to the recruitment of transmembrane proteins and intracellular signaling proteins. Some of these proteins are directly involved in spine formation, including kalirin-7, a guanine nucleotide exchange factor (GEF) for RAC1 that promotes spine formation possibly as a downstream effector of the EphB receptor (also see Chapter 10)40, SPAR, an inhibitory GAP for RAP that promotes the growth of dendritic spines41, and IRSp53, a downstream effector of Cdc42 small GTPase42. However, whether the effect of PSD-95 on spine depends on its interactions with kalirin, SPAR or IRSp53 is not yet known (Figure 18.2; Colorplate 11). A number of other signaling proteins are associated with PSD-95. One of these is the nitric oxide synthase (nNOS), a Ca2+/calmodulin-activated enzyme that produces the nitric oxide involved in regulating neurotransmission and excitotoxi-city. Interestingly, the ternary NMDAR-PSD-95-nNOS complex may functionally couple NMDAR gating to nNOS activation, as is suggested by the observation that disrupting the NMDAR-PSD-95 interaction with a synthetic peptide that mimics the last nine residues of NR2B reduces NMDAR-induced excitotoxicity without affecting NMDAR function43. Another abundant PSD signaling molecule that binds to PSD-95 is the synaptic Ras GTPase-activating protein (SynGAP), a GTPase-activating protein (GAP) for the Ras small GTPase which, after activation by CaMKII, suppresses the ERK pathway regulating synaptic plasticity. Heterozygous mice mutated for SynGAP show not only reduced LTP in the CA1 region of the hippocampus and impaired spatial learning, but also accelerated dendritic spine and synapse maturation44,45. PSD-95 also associates with the nonreceptor tyrosine kinases of the Src family46 and their upstream activator, proline-rich tyrosine kinase 2 (Pyk2)47, both of which are thought to be important for synaptic plasticity. It is therefore possible that it may localize the Pyk2-Src signaling cascade close to NMDARs, although the importance of PSD-95 scaffolds in synaptic regulation by tyrosine phosphorylation has not been directly investigated. PSD-95 also interacts with other scaffold proteins such as GKAP that binds Shank (see below), which in turn binds to additional signaling and scaffold proteins. PSD-95 is in any case more abundant (in molar terms) than NMDARs, and several times more abundant than GKAP and Shank48, thus suggesting its importance in integrating a large network of signaling and adaptor proteins, many of which also contain PDZ domains, although most of them do not interact directly with PSD-95. Importantly, PSD-95 greatly influences synaptic transmission and plasticity, mainly because it recruits the tetraspanning membrane protein stargazin to synapses by binding to its C-terminus. Stargazin and its relatives are associated with AMPA receptors and are essential for their surface expression and synaptic accumulation and function49,50 (also see Chapter 24). These data may explain why PSD-95 overexpression potentiates AMPAR-mediated excitatory postsynaptic currents (EPSCs), but not the currents of the directly linked NMDA receptor. The synaptic location of PSD-95 depends on the palmitoylation of two N-terminal cysteines (Cys3 and Cys5)51, and synaptic activity induces the removal of PSD-95 by depalmitoylating the two Cys residues52. A set of enzymes capable of inducing PSD-95 palmitoylation has recently been identified, but some controversy remains as to which of them is specific for PSD-95 and whether their function is regulated by synaptic activity53,54. PSD-95 can be degraded through the ubiquitin-proteasome pathway by means of direct ubiquitination of PSD-9555 or, indirectly, by the ubiquitination and degradation of the interacting protein SPAR56. In general, the activity-dependent dispersal or degradation of PSD-95 is often associated with a loss of synaptic AMPARs and weakened synapses, or changes in glutamate receptor-induced intracellular signaling such as CREB and MAPK phosphorylation57. Figure 18.2. 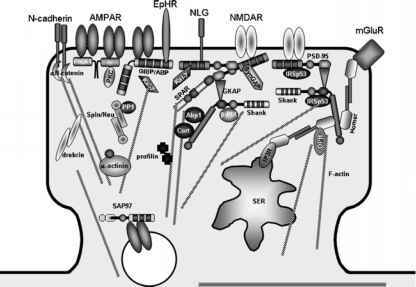 The Synaptic Scaffold Proteins Involved in Spine Morphogenesis. NLG, neuroligin; Kal-7, Kalirin-7; Spin/Neu, Spinophilin and Neurabin I; Cort, Cortactin; OPH, Oligophrenin. See Colorplate 11. Finally, it is important to underline the different properties of each member of the PSD-95 family. The proteins of the PSD-95 family have clearly different distributions in both brain and neurons. 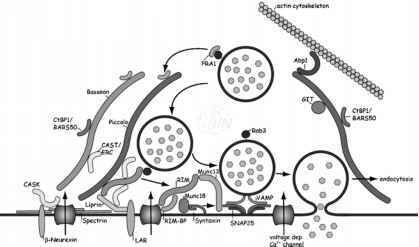 PSD-95 and PSD-93 are mainly enriched in the PSD, whereas SAP 102 and SAP97 are abundant in both cytoplasm and synapses, and found in dendrites and axons. The expression of SAP 102 begins early in postnatal development, whereas PSD-95 and PSD-93 are more abundant in later stages58. In vivo, PSD-95 family members apparently interact with different but overlapping sets of proteins, with PSD-95 being preferentially associated with the NR2A subunit of the NMD A receptor, whereas SAP 102 is preferentially associated with the NR2B subunit58. This suggests that the properties of the NR2B-SAP102 complex may be different from those of the NR2A-PSD-95/PSD-93 complex, and that the functional properties of synaptic NMDARs may depend on the prevalence of one or the other59. domain promotes the synaptic targeting of SAP97 and GluRl63. To some extent like PSD-95, the overexpression of SAP97 increases the number of synaptic AMPA receptors, induces spine enlargement, and increases the frequency of miniature EPSCs64,65.